Convertible strollers can be used in a single or double mode. If you are having your first child and planning on heaving a second one in the next three years, buying convertible stroller can save you a lot of money. You can use it as a single with the first child and convert it into a double by adding a 2nd seat. Once the first child gets older and doesn’t need a stroller any more, you can remove the 2nd seat converting it into a single stroller again. Very convenient! Keep in mind, convertible strollers weigh a few pounds more in a single mode because the base of the stroller needs to be larger and heavier to be able to hold two full loaded seats. That being said, I wouldn’t buy a convertible stroller if you are not sure about the second child. Now, if you are having twins, you definitely need one. 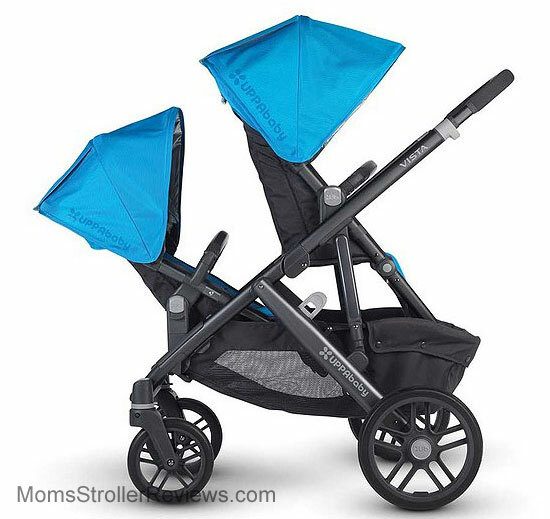 A few words about double stroller: I personally like inline strollers more than side-by-side models, because it’s much easier to maneuver at the store, mall, doctor’s office, or busy city street. It also has more seating combinations than a regular side-by-side stroller. The most popular convertible strollers on today’s market are Uppababy Vista 2015, Bay Jogger City Select, and Britax B-Ready. Let’s take a look at them side-by-side! As you know Vista 2015 got upgraded in 2015. The main upgrade was the second seat. Now, its a full size seat that has a recline and a nice canopy. That upgrade added extra weight to Vista pushing it into a convertible stroller category. It does cost more than B-Ready and City Select, but does come with a beautiful matching bassinet. What I like about Vista is the design of the frame and the seat. The canopy is huge and the telescoping handle bar leaves a lot of leg room in double mode. Also, the all-wheel suspension makes the ride very smooth. What I don’t like is that you need to buy separate adapters for different seat combinations. Also, there is only 1 seat combination that you can use if you have a newborn and an older toddler that is over 35 lbs, because the second seat weight limit is 35 lbs so your older child has to be in the main seat. This leaves no room for a newborn that has to be in the front in the bassinet. You can NOT have your newborn in a car seat with a toddler in the main seat. Something to keep in mind. Since the you attached the 2nd seat to the front of the stroller, it makes it pretty front heavy. When folding you will need to remove the 2nd seat unlike Britax B-ready where you can fold with both seats attached. 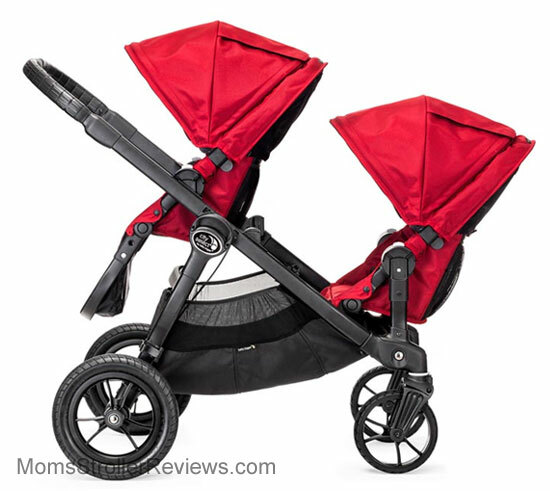 Britax B-Ready has a lot of a luxury features without a luxury price. The frame designed is surprisingly very similar to Vista 2015. It has a large canopy with a magnetic closure, easy to access large basket, never-flat tires and adjustable leg rest. I really like that you can use it with Britax car seat without any adapters. This saves you money and time. While it does not come with a bassinet, you can purchase one separately. It has 14 seat combinations! Another thing that saves time is that you can fold it with both seats attached. As perfect as B-Ready might sound, there are some drawbacks. Because in B-Ready you attach the 2nd seat to the back of the stroller and the handle bar goes up and down instead of telescoping out like in City Select and Vista, there might be not enough leg room for a tall parent. Also, the 2nd seat just like in Vista has a weight limit of 35 lbs. For an older child you can get a stroller board that easily attaches to the stroller. Just like B-Ready, City Select is full of great features, but has reasonable price. It weighs 28 lbs in a single mode which is heavy if you compare to a regular stroller, but is an average for a convertible model. It has a large canopy with a magnetic closure, large basket, forever-air tires, telescoping handle bar, hand brake, and adjustable leg rest. As you can see it’s very similar to B-Ready model. The 2nd seat has a weight limit of 45 lbs which is more than on B-Ready and Vista, and it attaches to the front of the stroller. This 2nd seat position makes stroller more front heavy, but leaves a lot more leg room. City Select has 16 seat combinations! You can also turn it into a pram or use it as a travel system with a car seat. Thankfully, there is a long list of popular car seats that work with City Select. Let’s talk about cons. While it works with wide range of car seats, you will need to get an adapter because there is no car seats that click right into the frame. When folding the stroller, you will need to remove the 2nd seat completely and make sure the front seat is facing forward. There is also no automatic lock so you have to lock it manually. 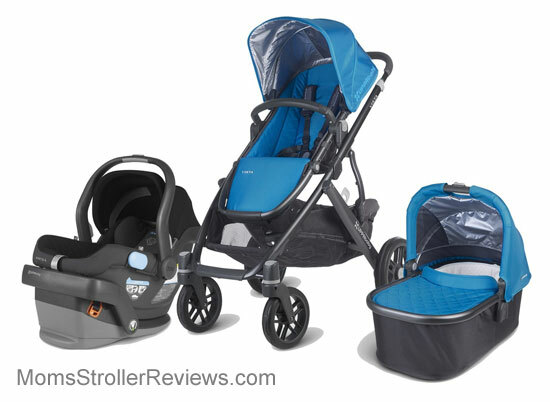 In the end, all three strollers are so similar it really comes to small details. I can’t say that one stroller is much better than the other. If price was not an issue, I would probably pick Vista 2015 because I just like the frame design, the seat colors, and the quality of the seat material a little more. Now, if you have twins, City Select is your only choice because both seats have higher 45 lbs weight limit. Otherwise, you will not be able to use the 2nd seat once your child is over 35 lbs (which might be 3 year old). My daughter Sophia is 3.2 right now weighing 35 lbs and she still needs a stroller if we go for a walk at the park or to the mall. This energizer bunny can run for hours, but once we walk away from the car far enough it’s like there is a spell that makes her little legs very tired. I don’t work out enough to carry 35 lbs child across the mall. So, I ALWAYS take a stroller with me. My husband the other day when we went to the park with a big beautiful lake said that we don’t need a stroller and he can carry her if she get tired. Guess who was laughing 30 min later when he had to carry her around the lake for 30 min? Ha! I didn’t want to say I told you so, but I just couldn’t help myself. I noticed that Sophia is 10 times worse around Daddy. I mean toddler tantrums are nothing new, but they intensify around him because she knows I am just going to walk away leaving her on the floor, but not Daddy! Daddy has super low tolerance for crying children, so she always gets it her way. I have one solution for a screaming toddler – BRING A STROLLER WITH YOU! It takes only a few minutes to strap your child in and wheel them out to the car, where you can transport them into a car seat and close the door giving yourself a minute of silence. I am sure at that moment you fantasize about walking back to the mall leaving your screaming child in the car. Oh, dreams…. Thanks for the direct Vista and city Select comparison. I know they are both front heavy when used as a double. Is one easier than the other to maneuver? Hello Susan thank you for the great review. My son will be 18 months when our second boy will be born. He is currently 14 months and weighs 28 pounds already and is pretty tall. I first had my eye on the City Select but when I finally tried it I realized how it would be impossible to maneuver with 3 heavy weight boys (I live downtown, there are a lot of hills and small sidewalks… And it snows 5 months out of 12..so I also need good wheels ). I’m hesitating between the Britax B-ready, which seems much easier to maneuver (and less expensive) and the uppababy vista. Where I live I can only see the models in single mode so it’s hard too see how they would handle with 2 kids. Also my husband has concerns about the Britax second seat being at the back and so low. Similar situation except my son is 18 months and only 19 lbs! He will be 2 when his sister comes. I need to be able to curb pop. We live in LA with hills and bad sidewalks. Often no handicap ramp. Which one do you think goes over curbs best?